This documentary film survey's the life of long-time Washington, DC resident, Ira Blount. Blount is an artist in Ward 7 who has used his creative skills to contribute significantly to the community. He acquired his skills through the influence of his mother who handmade many of life's necessities during the Great Depression. Blount's talents include quilting, calligraphy, origami, and basket weaving. The film was produced by Beverly Lindsay-Johnson, and narrated by Lorna Newton. 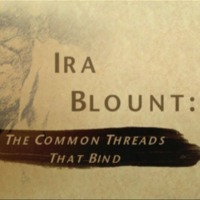 Lindsay-Johnson, Beverly, “Ira Blount: The Common Threads That Bind,” DC Digital Museum, accessed April 22, 2019, https://wdchumanities.org/dcdm/items/show/1280.